Riding around town on the Obama Obicycle continues to be a treat - hoots, hollers and words of appreciation at every turn. Here are a couple of my latest noteworthy encounters. Yesterday as I was on the Obicycle returning to my condominium complex I noticed a red Honda Civic in my rear-view mirror turning into the driveway behind me. My complex is small enough - only 19 units - that I recognize all the resident vehicles at a glance. This one wasn't familiar, so I assumed that it was someone coming to pay a visit to one of my neighbors. Oddly enough, the car caught up with me and kept pace, traveling right by my side. Yikes! This was not something a typical visitor would do. Suspicious, I decided not to turn into my parking space, and, instead, came to a sudden stop. The red Civic stopped too, and, before I could register my complaint, the woman on the passenger side of the car rolled down her window and asked, "is it okay if we take your picture?" "You bet," I replied, suppressing my inclination to give her and her companion a piece of my mind, since I had just come within a second of ramming them broadside! My second Obicycle tale of the weekend has to do with an incident that occurred while I was returning from the celebration of the first birthday of my grandnephew, Isaac Merlin. As with many of you, I have allowed myself to become hopeful these last few days - hopeful that we soon will be living once again in a country led by men and women of intelligence and good will, who will work to improve the quality of our lives and the lives of other people with whom we share this glorious, but all-too fragile, planet. Isaac's birthday celebration reminded me of how important that hope had become for me. On my way home on 8th Street, on the Obicycle, of course, a man - whose name I later learned was Jeff - called out to me from his Prius waiting at a traffic light behind me and asked, "Where are you going? I have some Obama stickers that I'd like to give you." I told him that I was heading in the general direction of Emory, not having a clue what he had in mind for me to do. "I'll pull in front of you. Follow me," he directed. With that I tailed Jeff - pedaling as fast as I could - to his house off of Charles Allen Drive. When I caught up with him in his driveway he fetched a backpack and retrieved a handful of Obama stickers he had printed out with designs by Shepard Fairey. Some had the retro "Rock the Vote" logo. 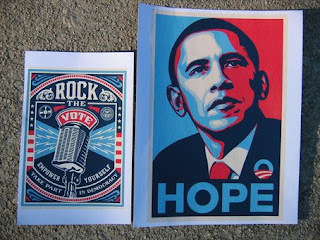 Others had the - now iconic - Barack Obama "Hope" portrait. Jeff had liked the signs I had made for my bike and, as a result, thought that I was just the person who could make good use of the stickers he had printed. These offers of hope for our future from Jeff - on the occasion of Isaac's birthday - could not have been more appropriate. More than eight years after this post first ran, the folks at Artsy asked if I would include a link to their Shepard Fairey page. I'm happy to oblige. Thanks Duder! What a day...a brush with possible death and a brush with possible life for the planet. And your touching reference to Isaac is heart warming.